Pink Blush Clearance Sale Ending Tonight! Hey there! Happy Tuesday! Things are getting a little tight around here and I'm sure that with only 8 weeks left (WHAT?!) are quickly going to get a lot more snug so I've been living in my more loose fitting maternity clothes. I'm loving this striped top, it's so comfy like I'm lounging around in a hoodie but it's a tee so I'm still staying cool even as the days are warming up! We are getting so much closer to having our perfectly timed remodel finished up (mostly) and I can't even express to you my excitement. I will literally have the nursery set up the second his floors are done, I don't care what time it is, it's happening. I feel like I've had to suppress my nesting phase since everything has been torn up so it will come out in full force here soon! I can't even wait. 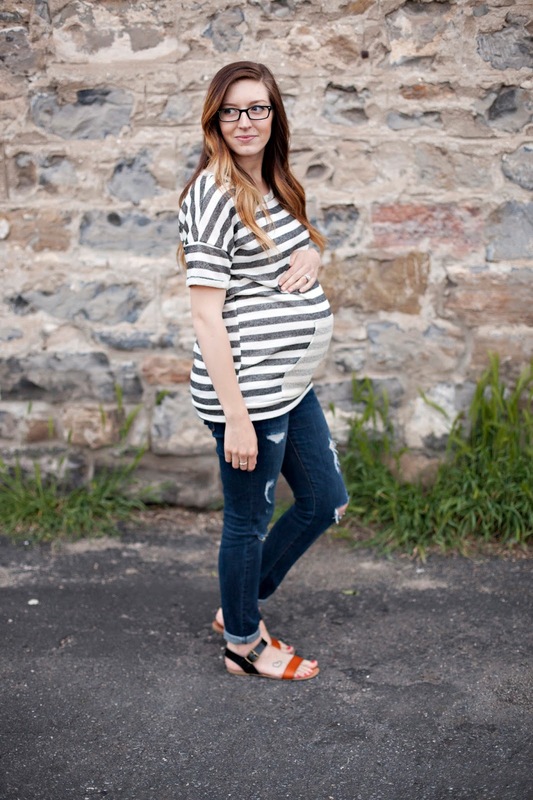 PS get an additional 50% off clearance Pink Blush Maternity items right now with code SALEONSALE50.